DON’T THINK I’ll eat this, I think, placing the grubby, aged box of curry powder back on the shelf to join the other culinarily-dubious, equally aged packets of foods there. The shelf the food occupies stands in a corner. I look around. A wooden bench serves as a seat below the window through which a diffused light flows to only partially illuminate the interior. A dilapidated kitchen chair and one those folding canvas seats used by car campers offer the only other places to sit. Both face a large fireplace containing the carbonised remains of past blazes. Who did those fires warm, I wonder, and when, and has anyone overnighted here since last Autumn? Seepage at the base of the fireplace has turned the earth floor soggy. Slowly, it seems nature is reclaiming this place. Climb onto the rocks behind Luckmans Hut and there’s a great view over the Derwent. We had parked the car some distance above the Big Bend of the summit road and scouted on foot, hoping to pick up a trace of the unmaintained trail that leads to the shack. Walking maybe half a kilometer up the road, we saw nothing. It wasn’t until we were coming back that I noticed what looked like a wombat pad leading into the scrub. We followed it, expecting it to disappear in the boggy soils around the clumps of pineapple grass. It did this, but then I picked it up again a little further along. I have followed animal pads before and soon recognised that this was one made by animals of the human species, not a route through the subalpine vegetation made by the cold-adapted wildlife that wanders around up here. The track — that’s really too grand a term for it, better to call it an indistinct trail — would be even more boggy after rain and, of course, it’s covered by snow in winter, off and on. Soon it started to descend into the stunted, twisted snow gums that inhabit this particular ecological zone of the mountain. Into the trees we go. It can’t be far from here, I think, if we’re in the right place. We stop and then I glanced to my right and there, blending into the surrounding rock and scrub, is the stone wall and metal chimney of the hut. 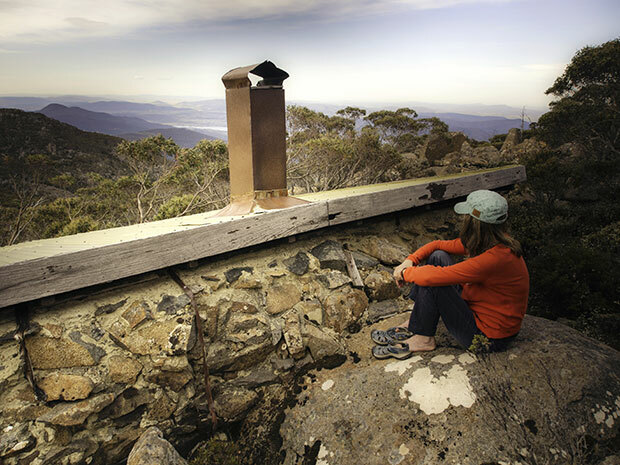 The original Luckmans Hut — it is named for one of the members of the Hobart Walking Club that built it — was constructed in 1938 as a ski shelter for the hardier types who made their way up here from the city of Hobart below. The scrubby slope adjacent, which we had followed to get here, was once the ski run, just a short fun slope, no rope tows. Across the road was a skating rink where those people of that bygone age made the most of winter’s ice. As I stand outside the little stone building I speculate that pleasures were taken simply then. 1938 — that was just before the outbreak of the Second World War. Did those folk who built and used this hut as a base for their weekend pleasures talk about events unfolding in distant Europe? Or was Tasmania then too isolated for the troubles of the world to impinge the minds of its inhabitants? Maybe, I thought, they avoided talking about distant events and what they might bring to their lives, and focused instead on the pleasures and friendships at hand, on their mountain. That’s a human thing to do, to focus on the immediate while mindful that disturbing things are happening elsewhere. It’s an easy thing to do in Tasmania as there’s a psychological isolation from mainland Australia and the rest of the world, something that must have been felt even more strongly in 1938. Destruction came in 1967. In that fateful year, a year etched into the consciousness of Tasmanians, bushfire raked Mt Wellington as it did to so many other places and one of its casualties was Luckmans Hut. Only the stone walls remained. Within two years of this devastation members of the Hobart Walking Club, including Fern Tree resident (Fern Tree is a village lower down in Mt Wellington’s forests) Roy Davies, rebuilt the hut. It is in the dim light of this resurrected hut we stand late this warm summer afternoon. Hobart City Council later took over the hut and minor works were later done to it by recent employment creation schemes, including making that wooden bench seat unbder the window. From a little further down, closer to the Big Bend, you can see the roof of the hut if you look closely enough in the right direction. As I described, the trail leading from the road to the hut is indistinct and referring to an online map can give you a clue where to start looking, as the roof of the hut appears as a fuzzy rectangle. For those Hobart residents who explore their mountain on foot, and for those with an interest in the history of this mountain, the whereabouts of the hut is already known. Today, Luckmans Hut is occasional overnight accommodation, as it was for those who left that ageing food on the shelf. The hut is an artefact of earlier human uses of Mt Wellington, of the simpler pleasures of times gone by, a historical relic still serving its original function of supplying shelter to the mountain traveler. It’s getting towards evening as we retrace our path back to the road. At the place I first noticed it I pause to look back and the thought comes that things like the hut endure, for some time at least. I reach back into my memory and remember hut builders Leo Luckman, who I met when living in Hobart decades ago, and Roy Davies who I knew in those times. Then I turn to walk up the faint trail and, as I do, I say a silent farewell to those people and to the modest little hut that their love of this mountain led them to build.